This simple article will focus your attention on a very useful feature of NetBeans which is the Start Page. Many of us unnecessarily ignore the start page as when we open the IDE we want quickly dive into coding. Why not to take a minute and get updated with the latest news from the NetBeans world? The Start Page consist of 3 sub pages – ‘Learn & Discover’, ‘My NetBeans’ and ‘What’s New’. Below I will explain each of them. ‘Take a Tour’ takes you on a guided video tour of the NetBeans IDE with a variety of screen casts that help you discover the new and noteworthy features of NetBeans IDE. 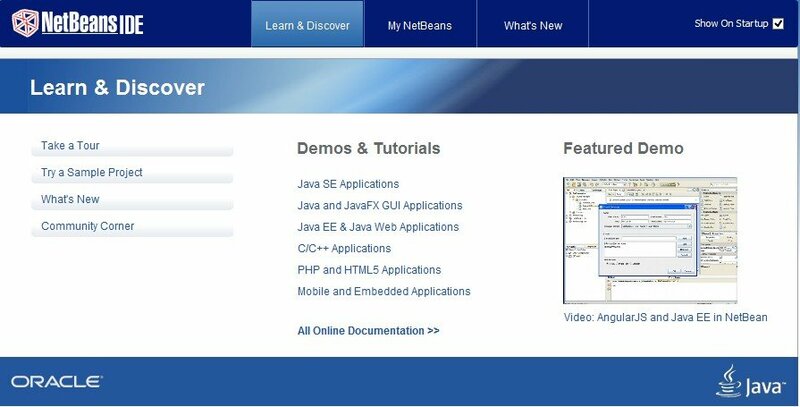 Take a Tour also has links to a NetBeans Media Library and the NetBeans YouTube Channel, where you can find extensive technical and community resources that include screen casts, demos, tutorials, podcasts, and video interviews. Allows you to try sample Java, JavaFX and NetBeans Module projects that are already built in NetBeans IDE. By using them you can learn by example how to code in Java. ‘What’s New’ takes you to the new release documentation where you can read about the latest available download and its features, download the latest release of NetBeans IDE and find links to many tutorials and guides. ‘Community Corner’ takes you to the NetBeans Community Portal where you can join and contribute to the NetBeans Community. ‘Featured Demo’ displays a video uploaded to YouTube that is interesting and worth a watch. The ‘My NetBeans’ page features your 10 recent projects so you can easily open them even if they are closed in the Projects window. ‘My NetBeans’ also contains the ‘Install Plug-ins’ link where you can install new plug-ins or just manage those you’ve already installed. ‘What’s New’ is the most dynamic sub page of all in the Start Page as it is constantly updated with the latest News & Tutorials as well as Blogs. If you wrote an article related to NetBeans it’s very likely you will appear on that list too. 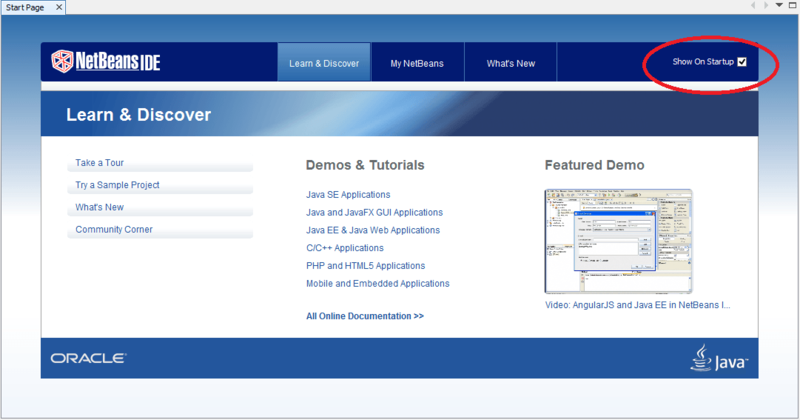 To display the NetBeans Start Page simply navigate to ‘Help’ on the Tool Bar and select ‘Start Page’. If you want the Start Page to appear every time you open your IDE just tick the box in the right top corner. However if you don’t want the Start Page to be displayed any longer just untick the box.